Kittens are born...and the next minute they are ready to leave home, or their drawer. One is still looking for a someone who will love and care for it. We simply cannot keep another. Four cats is absolutely enough. Anyway, I can't get any more food in the shopping trolley. An old Geordie gent tapped me on the arm this morning, pushing my piled high trundler out of Woolies, "Back agin t'morrow, will 'e?" Is $500,000 'generous'? It's only around 30 cents a household. Perhaps 'generous' needs to be prefixed with 'relatively'(as compared to previous appeals, not countries). The Australian government has pledged 13 times the amount that NZ's has. Some people have a problem with the government sending 'their' money - I don't. This is a valid area for collective action. In any case, our government can and does waste $1,000,000 at the drop of a hat at home. The NZ Herald reports on the associate Minister of Social Development strongly disagreeing with the Minister of Social Development over the proposal to require the unemployed to re-apply for the dole after one year. "This is a vulnerable group ... Surely if you are saying people are unemployed for too long and malingerers, then you have to be really clear about taking steps to help them back into work. " Except "malingerers" do not want help. This is going to be a year of sparks flying between these two. Despite The Herald saying they have worked closely together so far, at least two other deep divisions between the two come readily to mind. Work-testing the DPB and putting at-risk Maori children in placements away from whanau. I don't know how the decision-making hierarchy pans out. You may. An Associate Minister has responsibility for specific areas but I imagine ultimate authority still rests with the Minister. Is that correct? Apart from which any Bennett/National legislative policy will get the numbers anyway. Is there a problem with GPs? I am hoping to attract MacDoctor's attention and expert input. Health is not a sector I have studied in any depth. So I stand to be corrected on the following conclusion. Waiting in the surgery with my poorly (that's an old-fashioned term for sick) daughter days back I overheard the receptionist telling someone via phone that the practice could not see them because they weren't registered there. She gave a number to ring where someone would tell them which Hutt Valley practices were taking on patients or the caller could go on the waiting list to be taken on at that particular practice. Another incident was recently recounted to me about a young woman who turned up with shingles or chicken pox at a pharmacy. The virus was getting near her eyes and the pharmacist was very worried about her and tried ringing several practices in an effort to get her in front of a GP. As I understand it, Labour poured an extra couple of billion into primary health. They changed GP funding. GPs are now paid per capita. That is they are paid for each enrolled patient whether they see them or not. I have heard that the DHBs are now becoming quite frustrated with some GPs because they are taking time off. And they are not enrolling new patients. Apparently GPs describe the problematic situation as an economic one. But it has been suggested to me it is an ethical one. Not long ago we needed a plumber urgently. It was a Saturday morning and we had a burst main flooding the garden. I deal with a fantastic outfit, and a plumber was there within a couple of hours. He worked all day to fix the problem. He was able to go and get the supplies he needed because hardware stores open all weekend because they are staffed by people prepared to work all weekend. Outcome; Labour upped the spend on primary health substantially for no increase in productivity. I did several years in social work and 'early intervention' and my pet hate is health promotion forced on this area. Lets not get real with people and say ' he/she is a looser and you can do better', 'this is how to hang out washing', 'you need to get up at seven to get your kids to school, 'lets sit down and take a look at the list of groceries you need this week', how about we take a family trip to the park/beach/pool and make some sandwiches for lunch', 'how about we look into jobs, or courses'.... instead lets take them to expo's and more agencies to address smoking??? Lets do more assessments, lets keep ticking the boxes and insisting that the babies get all their vaccinations and tick all those boxes and if they dont do it' report them to CYFS, lets give grass roots workers impossible caseloads so they end up unintentionally colluding, so the experts with more impossible caseloads can in turn, miss the warning signs of yet another otrocity and blame it on the grass roots workers blah blah. You said it well Lindsay in your blog , and until people can tackle the everyday monotonous living that they probably never experienced consistently, why would they give up what seems their only pleasure at all. Especially with all the do gooders around to bore them and stress them out more! I'm Maori, single ma, smoke and drink, have great friends and whanau, have a great job and look after us and I enjoy life. I dont see the health promoters knocking on my door :-) GET REAL PEOPLE!!! Over at The Standard they are talking about unemployment causing crime again. A Government that really wanted to reduce crime, rather than one that was simply pandering to populism to get elected, would concerntrate on the well-known and understood causes of crime – the biggest of which are unemployment-induced poverty and deprivation. Or let's put it another way. A forty five percent drop in unemployment, which delivered maybe a 10 percent drop in crime, does not show a strong association. Return to their graph and consider something else. Using their scale, when the right-hand axis reaches zero - or full employment - the left-hand axis will still be showing about 78,000 crimes. Now, one last thing. Imagine if the same treatment was given to this graph as occurred to the first. There would be no correlation whatsoever. Are we, or are we not, highly taxed in NZ? For historical interest, the statistical tables attached to the final graph show that in 1955 (when our per capita income was relatively high) the OECD average tax on income and profits was 9 percent of GDP. NZ's was 9.1 percent. By 2007 (when our per capita income is relatively low) the OECD average was 13.5 percent and NZ's was 22.3 percent. And note also that in Canada, Sweden, Finland and the US the percentage has fallen in the past few years. Ours has risen. When I read this headline, Socialist soaps wanted, I thought it was about cleaning agents. And for the life of me I couldn't imagine what a socialist soap would look like. How would it differ from any other soap? Perhaps you are told that you can all share it, use it every day, and it will never run out? Or perhaps that you can all share it, use it everyday and the state will give you more when it runs out? Perhaps, and this would make sense of the headline, it is rationed and acquired only by using soap stamps? Maybe socialist soap cleanses the spirit of nasty self-interest? Any other ideas? How generous are New Zealanders? Americans gave 1.60 percent of their aggregate personal income to charity, more than double the 0.73 percent that Canadians donated to charity. This tweaked my interest. Canada has a bigger public sector than the US and my assumption is that where government does more, taxpayers give less to private charity. So how would NZ compare on this basis? It is estimated that NZ individuals, as reported on tax returns, give $356 million annually (c 2004). In 2004 there were approximately 1.494 million households with an average income of $63,384. So New Zealanders give an average of 0.38 percent of their aggregate income. On this basis (tax receipts kept) in 2004 our household gave approximately 0.5 to charity but with economic uncertainty I have cut back to around 0.43 percent. I am now feeling rather stingy. This post could get me banned from Red Alert because people do get banned from there, quite frequently. Kerre Woodham’s column in the HoS today promotes letting or even encouraging kids to take some risks. Too often risk averse parents and schools wrap kids in cotton wool to the point where they don’t develop the power to judge risk and make their own decisions. expat – every now and again we do a more general post to test reaction to Red Alert and the style people want. What comes through very clearly is that users want a much tighter moderation policy here than at Kiwiblog or The Standard. That includes staying on thread, language and tone. It means that lots of individuals who don’t feel safe on other blogs feel ok commenting here. That is the end of the debate on moderation on this thread. All further off thread comments will be deleted. I couldn't post my reaction to this at the site because my comment would be "thread-jacking" as was expat's. But do you see the delightful irony in Trevor's closing remarks? 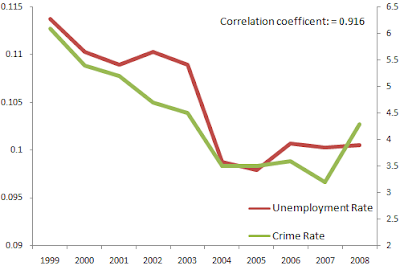 According to the Wall St Journal the theory that crime is caused by "income inequality" and "social injustice" has been "demolished" by continuing falling crime rates coupled with rocketing unemployment. Over seven million lost jobs later, crime has plummeted to its lowest level since the early 1960s. If crime was a rational response to income inequality, the thinking went, government can best fight it through social services and wealth redistribution, not through arrests and incarceration. Even law enforcement officials came to embrace the root causes theory, which let them off the hook for rising lawlessness. Through the late 1980s, the FBI's annual national crime report included the disclaimer that "criminal homicide is largely a societal problem which is beyond the control of the police." Policing, it was understood, can only respond to crime after the fact; preventing it is the domain of government welfare programs. Of course, it wasn't only the US that went down this path. At the start of the recession, the two police chiefs who confidently announced that their cities' crime rates would remain recession-proof were Los Angeles Police Chief William Bratton and New York Police Commissioner Ray Kelly. As New York Police Commissioner in the mid-1990s, Mr. Bratton pioneered the intensive use of crime data to determine policing strategies and to hold precinct commanders accountable—a process known as Compstat. Commissioner Kelly has continued Mr. Bratton's revolutionary policies, leading to New York's stunning 16-year 77% crime drop. The two police leaders were true to their word. In 2009, the city of L.A. saw a 17% drop in homicides, an 8% drop in property crimes, and a 10% drop in violent crimes. In New York, homicides fell 19%, to their lowest level since reliable records were first kept in 1963. The Compstat mentality is the opposite of root causes excuse-making; it holds that policing can and must control crime for the sake of urban economic viability. More and more police chiefs have adopted the Compstat philosophy of crime-fighting and the information-based policing techniques that it spawned. Their success in lowering crime shows that the government can control antisocial behavior and provide public safety through enforcing the rule of law. Moreover, the state has the moral right and obligation to do so, regardless of economic conditions or income inequality. That may be right. But I think there is more to it. There has been a sea-change in US thinking over the past 30 years. Americans were focussing on welfare and its role in society long before Clinton's federal legislation was enacted. For instance from the 1970s people receiving social security because they were drug or alcohol addicted had to attend rehab courses, have a benefit payee and there was a 36 month time limit. I am not saying this was particularly successful but use it as an example of their keenness to prevent long term worklessness. More importantly, various states were trying out different approaches to prevent welfare undermining the institution of family, particularly black families, recognising that strong and enduring families are one of the greatest deterrents to crime. All of this culminated in the famous 1996 Clinton welfare reform act - PRWORA - the Personal Responsibility and Work Opportunity Reconciliation Act. It's a mouthful but when you break it down and think about it, the words embody the opposite of what leads to crime. Irresponsibility and idleness. The state can and does influence moral thinking. Americans do not wince about using the words "personal responsibility". They use them to name laws. In NZ too many people do wince. For them it means "individual responsibility", which translates to "individualism", which translates to "selfishness and greed" (see a comment from Friday that directed me to "stop thinking only of yourself"). So what do we have as a result. Our crime rate, specifically violent crime, continues to grow. And it would appear we are going to go down the unavoidably hard line of locking up more and more people but without any accompanying move towards instilling in society a different attitude towards responsibility. It has to start with the individual.